The Philippines is known to be one of the mangrove biodiversity centers in the world (next to Indonesia). Mangroves provide several ecological and socio-economic services to coastal communities valued at US$ 292,000/ha (UNEP 2007). However, there have been massive mangrove losses particularly during the 1970s-1990s periods. Most of these losses can be attributed to conversion to aquaculture ponds particularly in the provinces of Pangasinan and Iloilo. The loss of mangroves may result to increased vulnerability (and reduced resiliency) against natural disasters such as typhoon and storm surge. The projected impacts of climate change, primarily sea level rise (McIvor et al. 2013; Gilman et al. 2008), will further reduce mangrove areas in the country. To address mangrove degradation, various mangrove planting programs have been implemented in the last thirty years. However, most of these planting programs are located in suboptimal conditions, hence survival is low and growth is stunted (Salmo III et al. 2013). There are limited studies that quantifiably document the contribution of these planting programs. Understanding the role of mangroves in enhancing coastal ecosystem health, and providing evidences that it will save lives and properties will be vital in crafting policies that will govern mangrove management. We welcome volunteers – researchers, students, advocates – to help us generate information and knowledge about Philippine mangroves. Together, we can make a progressive approach on mangrove research and management! Congratulations Vanessa Malapit for successfully defending her thesis, entitled “Assessment of Vulnerability of Mangroves Against Sea Level Rise Using Vegetation and Sediment Attributes” on 23 November 2018. Dr. Salmo served as one of the plenary speakers in the recently concluded 4th International Symposium on the Effects of Climate Change on World’s Oceans (ECCWO) in Washington DC, USA on 8 June 2018. He presented ““Coastal Ecosystems and their Blue Carbon Science, Conservation and Policy Progress”. He also presented the results of his consultancy work on Blue Carbon Assessment in the Verde Island Passage (VIP) in Conservation International main office in VA. Some photos here. We updated our list of publication including 2018 articles as well as non-mangrove articles. Carmela Garcia (MSc ES), Celine Campos (BSc ES), Tin Dalida, Bill Dimalanta (BSc ES) and Ginny Tiongson (BSc ES) graduated last 25 May 2018. These students did their theses with the project with topics on biodiversity, carbon sequestration, sea level rise, and impacts of increased sea surface temperature. Congratulations team! The 2nd State of the Mangroves Summit was held at the Faber Hall of Ateneo de Manila University on October 1-2, 2015. This event was part of a series of Mangrove Summits that focus on the state of mangroves, and mangrove management all around the Philippines. 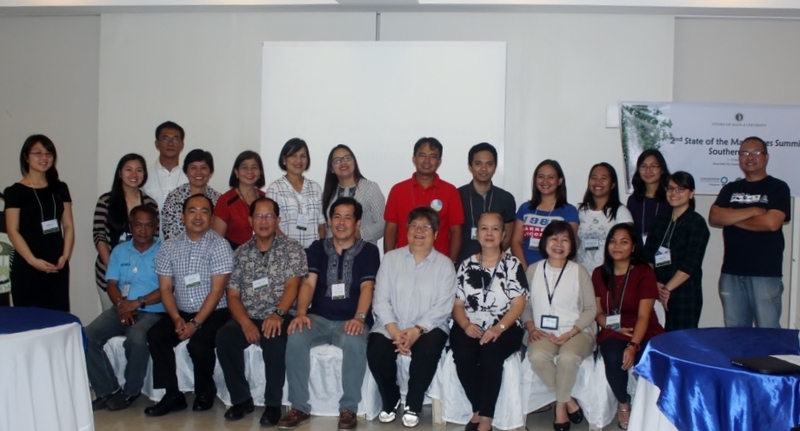 The 2-day summit was hosted by Ms. Abigail Favis, a faculty of Ateneo’s Environmental Science Department and Campus Sustainability Program Manager of Ateneo’s Institute of Sustainability. A total of 48 participants attended the summit. 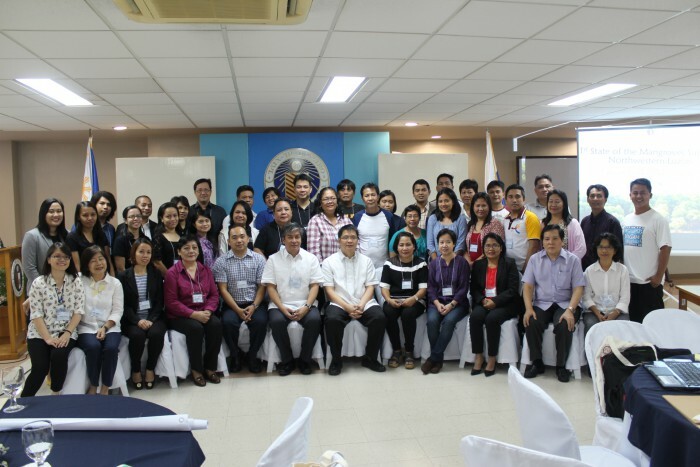 The participants came from the academe, national and local government agencies, and environmental NGOs. The Ateneo de Manila University is hosting the 1st State of the Mangroves Summit: Northwestern Luzon on October 23-24, 2014.